For years, THEY improv has been performing for corporate clients as well as families to provide quality entertainment. To do so, this has included working at all sorts of venues including cruise ships, resorts, hotels, religious facilities, public parks, banquet halls, offices, conference halls and even people's homes. Wineries, vineyards and tasting rooms became popular venues for our events and we became more and more aware of the need to create specialized formats that can work with these locations. After all, these were far different than those for our normal Fortune 500 clientele. THEY improv began in 2004 in South Florida serving a variety of charities with their Comedy With a Cause program. Working with charities, both big and small, THEY were able to raise tens of thousands of dollars for all kinds of causes. Their shows were popular and were making waves. Utilizing this popularity, THEY improv started to market towards corporate clients. Starting from these humble beginnings. THEY improv expanded to now having operated in all 50 states, as well as Washington, DC and Puerto Rico. Their clients include over half of the Fortune 500 and come to them from all over the world. 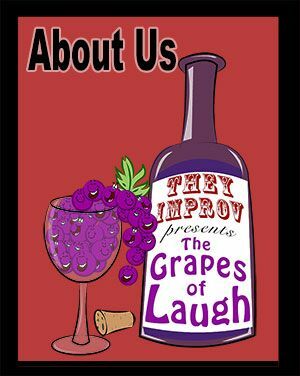 THEY improv created The Grapes of Laugh as a way to focus entertainment options for their clientele looking to have entertainment come to local wineries, vineyards and tasting rooms around the country. To find out more about THEY improv, you can go to the THEY improv website.